MEMSA is a nonprofit, statewide, professional association committed to high quality emergency medical services across Missouri. Since 1983, MEMSA has provided leadership in education, training, and pre-licensing EMT and EMT-P practical testing as well as legislation. MEMSA provides a forum for EMS professionals to accomplish common goals that ensure quality EMS care is delivered statewide. MEMSA members are actively involved in collaborative efforts to achieve these and other goals. A Clinical Ladder for EMS - What do you think? Representative Roden has introduced a Bill in the House (HB 907) to allow licensure of paramedic practitioners. The vision is to provide another rung on the clinical ladder for paramedics and a road for advancement. Presently paramedics can become nurses with the option of seeking to be an advanced practice nurse, a physicians assistant (PA) or a doctor. HB 907 would create another option under the law that would be similar to the PA.
We don’t know yet if the bill will pass this year, but it has certainly generated a lot of conversation. The survey below is designed to measure the level of interest paramedics and EMTs might have in pursuing further educational opportunities to advance their career in a clinical setting. Please take 5-7 minutes to share your thoughts by completing the survey. The survey will close at midnight April 12. Missouri EMS Conference & Expo 2019 - Registration is open! The Missouri Emergency Medical Services Association (MEMSA), Missouri Association of Air Medical Services (MOAAMS), and The Missouri Ambulance Association (MAA) are excited to invite you to the 2019 Missouri EMS Conference and Expo in Osage Beach, MO! 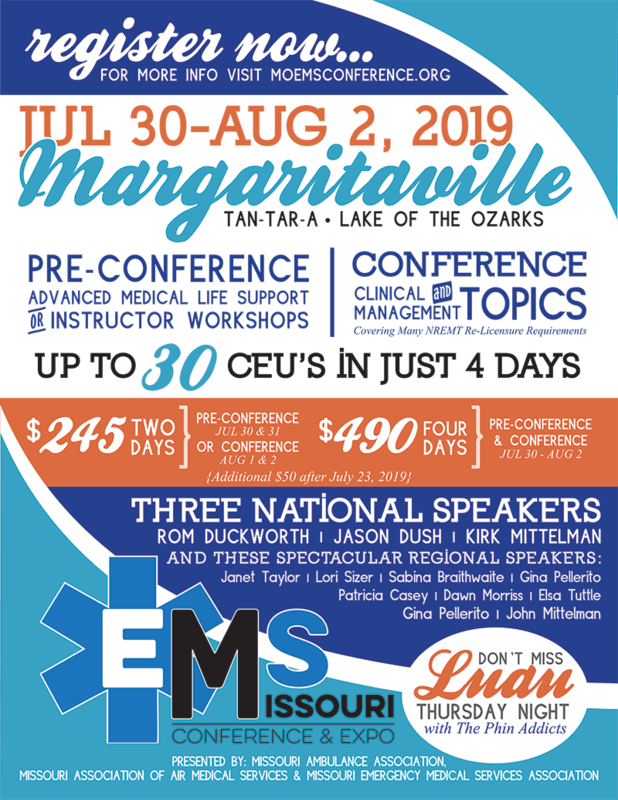 There will only be one EMS conference in Missouri in 2019, so make sure to register now! Where quality education meets fabulous networking, we plan to provide you with the latest info in training, equipment, and tools to make your job easier while providing the highest quality care for your patients. VIEW COMPLETE DETAILS AND REGISTER HERE. In Missouri, we have a TCD system that should be the envy of the country and is instead very troubled. How we got here is a long story, and there is plenty of blame to pass around, but we also have a good chance to make some serious improvements to the program. The Director of the Dept. of Health and Senior Services has established a committee to address problems with the TCD system in Missouri. MEMSA will be posting meeting summaries and other items of interest on our new TCD discussion page. Feel free to read over the materials provided and make comments if you want. Improvements will only come from the engagement of people who see what a great TCD system can mean for the patients we serve. MEMSA's new phone number is (573) 370-1702. You can reach Mary Napier, membership specialist at that number or email her at memsa@memsa.org. In 2017 Governor Greitens directed all Missouri agencies to review the present regulations and consider which ones might be eliminated. That process continues under Governor Parson. As part of that general discussion, SAC (State Advisory Council on EMS) has been reviewing all the core EMS regulations in order to provide recommendations to the DHSS. 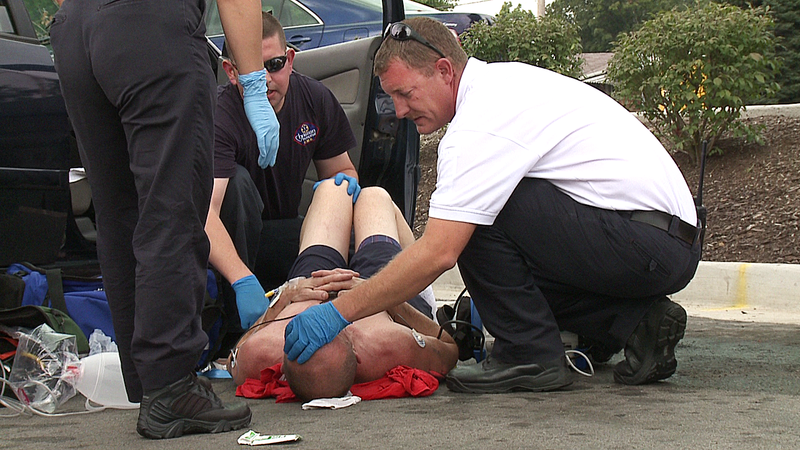 SAC is hosting a series of meetings to seek input on the current EMS regulations. Those meetings times and places are posted on the BEMS website https://health.mo.gov/safety/ems/. As revisions are made, drafts are posted on the MEMSA website and open for further comment. The goal of the SAC is to get consensus within the industry prior to submitting recommended changes to the DHSS for their consideration. The discussion forum on our website is an informal process separate from the official process DHSS and the Secretary of State conduct, but this is the best and easiest way to engage and review regulations that were written in 1998. What should be updated, changed, added, dropped, re-worded to clarify, etc. EMS is nearing completion of its review. The process for DHSS to move the regulations revisions forward can be arduous so final approval will not be immediate but we believe streamlined regulations will be a big improvement when we get to the finish line. Please spend a few minutes looking over the state EMS regulations and visit the new draft posted on the regulation page of our website. Please leave your comments and suggestions on these topics in our discussion forum. Place your job listings on our site at No Charge! Contact MEMSA today!